In an ideal world, these qualities would describe all Houston juvenile attorneys, but as so many dissatisfied, disheartened and disrespected former clients of some other lawyers have learned to their peril, it simply does not. obtaining an acquittal at a jury trial. how many jury trials, if any, the attorney has tried and has won. Call Harris County Juvenile Lawyer James Sullivan at (281) 546-6428 to discuss your child's case. 1) Is the Houston juvenile attorney board certified in juvenile law? If not, why not? 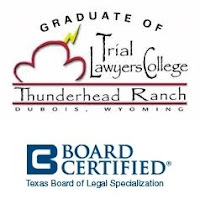 The Texas Board of Legal Specialization (TBLS) is the only governing board to certify lawyers in legal specialty areas. The Board was was established in 1974 by the Supreme Court of Texas at the request of State Bar of Texas. There are over 70,000 lawyers licensed to practice law in Texas, and only 7,000 have earned the right to be publicly recognized as Board Certified specialists in one of 21 select areas of law. Board Certified lawyers earn the right to publicly represent themselves as a specialist in a select area of the law. In fact, they are the only attorneys allowed by the State Bar of Texas to do so. This designation sets them apart as being an attorney with the highest, public commitment to excellence in their area of law. In Texas, there are only 65 lawyers Board Certified in Juvenile Law, and only 38 of those are in private practice. To become Board Certified in a specialty area, an attorney must have been licensed to practice law for at least five years, devoted a required percentage of practice to a specialty area for at least three years, handled a wide variety of matters in the area (including jury trials and certification hearings) to demonstrate experience and involvement, attended continuing education seminars regularly to keep legal training up to date, been evaluated by fellow lawyers and judges, and passed a 6-hour written examination. 2) What is the Houston juvenile attorney’s reputation in the legal community? One well known company AVVO maintains a list of lawyers, doctors and dentists. Fellow professionals in their respective community can endorse them and actual clients can submit reviews. Their website gives some insight into the reputation of local professionals. 3) Does the Houston juvenile lawyer have any disciplinary history by the Texas Bar? This can be checked at the Texas State Bar website. The Juvenile Defense Attorneys at James Sullivan and Associates are not interested in publicity, public accolades or recognition. Even in high profile cases, they seek to shield their clients from publicity. They are only interested in getting the best possible result for their clients. Their fees are affordable and they are approachable. Jim Sullivan is Board Certified in Juvenile Law by the Texas Board of Legal Specialization. Juvenile Law is different than criminal law. Jim Sullivan has also received reviews by fellow attorneys and clients on AVVO. Houston Juvenile Attorney James Sullivan attended Baylor University and South Texas College of Law. He has been married over 25 years, is a Christian and worships at a local Catholic church. James Sullivan earned his Eagle Scout award at age 14. If you need a Houston criminal or juvenile attorney, you can call James Sullivan at (281) 546-6428.